The Fireray 2000 EExd is a beam-type smoke detector from Fire Fighting Enterprises Ltd. It is the only beam detector in the world certified to ATEX 94/9/EC standard for use in Group 2 hazardous areas, and brings the benefits of wide-area smoke detection to environments with a risk of explosion, the company says. 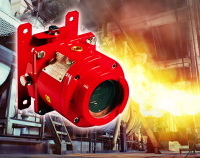 The Fireray 2000 is ideal for oil rigs and refineries, petrochemical plants, power stations and storage depots. Each F2000 EExd is comprised of three parts – an infrared transmitter and a receiver placed on opposing surfaces, and a low-level control unit, all ATEX-certified. Any smoke entering the beam path is detected by the loss of signal strength between the detector heads, so product can cover an area of up to 1,500 m2. The beam is effectively 15 m wide, and the heads can be up to 100 m apart. As with other Fireray products, the F2000 EExd has a drift compensation feature to guard against gradual loss of signal caused by dust build-up on the detectors or building shift, reducing the incidence of false alarms, the company says.